Chrome-alignés, barils de bouton rayé disposent de 223 chambres Wylde et torsion 1-8" pour une meilleure précision potentielle avec 223 et 5,56 munitions de l'OTAN. Procédé unique de chrome-doublure maintient uniformité tout au long de l'alésage et main-rodage permet de garantir les rainures et les terres lisses et uniforme. Ports du gaz sont optimisées pour la longueur du canon et chambering afin d'assurer un vélo fiable et sont disponibles pour carabine, mi-longueur et des systèmes de gaz pour carabine. Aussi caractéristiques 1/2"-28 tpi museler les threads pour comps standards et flash hiders, plus M4 rampes d'alimentation sur le prolongement du canon à l'aide d'alimentation sans heurt et fiable. Barils maintenant sont dotés d'une fossette face au port de gaz, afin de ne jamais changent de blocs vis-sur le gaz au moment du tir. Barils contours hybrides ont un contour effilé et réduit sous le garde-main pour gagner du poids. Fonction contour barils HBAR. 870" diamètre sous le garde-main pour la rigidité et absorption de la chaleur supplémentaire. SPECS : longueur – 16, 18 ou 20 pouces. Profil – hybride ou HBAR (18" et 20" uniquement). Système au gaz – Carbine ou mi-longueur (16"). Fusil (18" et 20"). Chambre - 223 Wylde. Finition - Parkerized. Chrome bordée. Construction - 4150 acier au Chrome molybdène. Baignée à la main. Comprend le prolongement du Canon avec M4 feedramps. Dimensions -. 750 » OD dans le port de gaz. 1.9" longueur à bloc gaz. Discussions – ½-28. Chrome-lined, button rifled barrels feature 223 Wylde chambers and 1-8" twist for enhanced accuracy potential with both .223 and 5.56 NATO ammunition. Unique chrome-lining process maintains uniformity throughout the bore and hand-lapping helps ensure smooth, consistent lands and grooves. Gas ports are optimized for barrel length and chambering to help ensure reliable cycling, and are available for carbine, mid-length, and rifle gas systems. Also features 1/2"-28 tpi muzzle threads for standard comps and flash hiders, plus M4 feed ramps on barrel extension to aid in smooth, reliable feeding. Barrels now feature a dimple opposite the gas port, so screw-on gas blocks do not shift during firing. Hybrid contour barrels have a reduced and tapered contour under the handguard to save weight. HBAR contour barrels feature .870" diameter under the handguard for rigidity and extra heat absorption. SPECS: Length – 16, 18, or 20 inch. 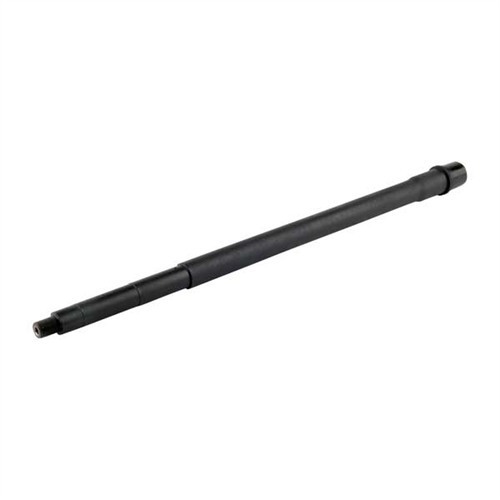 Profile – Hybrid or HBAR (18” & 20” only). Gas system – Carbine or Mid-Length (16”). Rifle (18” & 20”). Chamber - 223 Wylde. Finish - Parkerized. Chrome lined. Construction - 4150 Chrome Moly Steel. Hand Lapped. Includes barrel extension with M4 feedramps. Dimensions - .750” OD at the gas port. 1.9” length at gas block. Threads – ½-28. This wonderful barrel shoots small groups like a heavy barrel does. It cleans easily with minimal copper fouling. I can shoot a hundred rounds through it and at the end it is still shooting small groups. Installed myself as a first time AR build, put on a RRA and used the RRA free float package (from Brownells)that comes with gas tube, pin, hand guards and free float nut. This kit, the barrell and a gas block converted my 16" to a tack driver. Groups 2 of 3 shots on top of each other every time at 100 yard, only shot HSM 55 gr Vmax so far, this stuff was available and I never shot it before so the ammo must be good too. Only thing I did not know was this barrel is not dimpled for the gas block set screws, might work better with a clamp gas block, but with carefull use of the right lock tight, it works. The barrel balances nicely with a standard rifle lower or a carbine lower with a UBR stock. Mine is mounted in a standard forged upper with a Hogue overmolded FF tube and a Sims Barrel De-Resonator. This barrel shoots Southwest 77 SMK and handloaded 77 Noslers under 1" at 200 meters. The De-Resonator makes a big defense, group size was triple while tuning it. It is also very easy to clean. This barrel will shoot sub MOA with any ammo i put through it. For giggles I wanted to try 5.56 62gr AP rounds knowing that they dont do well in most rifles. Average spread should be 4-6MOA at 100. However I got .5 MOA. All my other tack drivers get 1 MOA with that ammo. Big improvement! Match ammo gets hole on hole accuracy. Thats with the 52, and 69 gr I put through it. Will be buying more a lot more of these barrels. I really like this barrel. It's not too heavy, but definitely stiff enough for target use. The finish is perfect and fits the receiver perfectly. The 1:8 twist is perfect with a .223 Wylde chamber and 20" barrel. Remember, the faster a bullet is traveling when it leaves the barrel, the more RPMs it's doing. And this barrel is fast. I'm averaging 2854 on a 70 degree day with Black Hills 77gr 5.56 (MK 262 Clone). With only about 40 rounds thru it I'm under 3/4 MOA. Each time I clean the barrel it shoots better. 55 gr, and 69 gr all shoot just as well. With the chrome lining, I'm sure this thing will last many many thousands of shots. Buy with confidence, I drove myself nuts trying to choose a barrel. The other reviewers helped me to make up my mind, and I'm glad I chose Criterion. I didn't believe the other reviews (if it sounds to good to be true...), but I figured I would throw one on one of my beater rifles and see how it would do. The rifle I put this barrel on is my beater because I throw it in the floor board of my mud truck or in the bed drive out to were I want and shoot it. needless to say, it gets bounced around, scratched, and dropped pretty regularly and WAS a constant 4-6 moa rifle being feed nothing but cheap Wolf steel cased fmj ammo. I was both shocked and a bit tickled as soon as I began to shoot it with this barrel. Still I beat on this rifle and feed it only Wolf steel cased FMJ or Lake city surplus and it ALWAYS shoots 1.25 moa or better (mostly 1-0.655 MOA). It has my beater RRA shooting on par with my +$4000 LWRC R.E.P.R. and its chrome lined. These are hands down one of the best barrels for all around muti-pupose rifle I will be buying one of the 16" barrels for another rifle and hope to see the same and most likely better results. Buy this with complete confidence!!! I was really surprised by the accuracy. I wanted to build a low-maintenance upper that would shoot ~1 1/2 MOA or less. Chrome lining seemed to be the answer. So, I get it together, bore sight it and take it to the range. Got it on paper at 25 yards, then put a target out at 100 yards. With iron sights my first 3 shots at 100 made a group of .28"! This thing shoots like a laser! The only fly on it is it is an 8 twist instead of 7. I'd prefer a 7 because I am going to try the 85gr Nosler RDF. After getting the barred fitted and thoroughly cleaned I finally made it to the range to put the first rounds down range on my new 20" Hybrid CBI 1:8. I ended the day with a 5-shot 5/8" group at 100 yards, pretty awesome for a chrome lined barrel. Cant wait to do some further load development. Could not be more pleased with every aspect of this barrel. Never found any copper fouling in the bore. Even after initial 175 rounds without cleaning. That put a grin on my face. Was using a full SAMI charge of Ramshot TAC under 55 grain bulk bullets. So no trick there. Accuracy is there. Barrel stays cool relatively in an NRA pace rapid fire string. Iâve owned an SP-1 Colt with the A1 featherweight barrel since the 1970âs. Those featherweights do heat up. Was shooting ten shot groups with this Criterion Hybrid contour and could not see any drift in impact due to heat up. I only get eight good shots from my Rem 700 Varmint heavy rifle in 223. Before heat mirage rises in the scope and ruins accuracy. Free floated the barrel in a one pound forearm tube so this is no lightweight rifle Like my SP-1 but by far handier than my twenty inch bull barrel upper. All the barrel weight needed in a coyote hunting rig. In my opinion. I donât need the extra diameter past the front sight that was added on the A2 to prevent bending the barrel when using bayonet to break steel bandings on crates. But it does help in holding the barrel down so you can see bullet impacts in scope. Replaced a M16A1 pencil barrel with this barrel. Son had good results with his 18 inch. Rifle is used for local tactical match and home defense. I was able to shoot two, three shot groups that were easily covered with a quarter after less then 18 rounds getting sighted in at a 100 yards. This with my reloaded Bulk Hornady 55 FMJ.. No issue with my build using a JP forend. If I miss now I have no excuse. I use Criterion stainless barrels for many builds. I tried their chrome lined, and found it to be very high quality and accurate. I shot it out to 600 yards and was constantly hitting steel Makes a great SPR with an extended service life. I am at the point where most of my competitive shooting is to determine who buys lunch. So far I'm saving money and getting fat thanks to an excellent Criterion Barrel. I use Criterion Hybrids on all my AR builds. This particular barrel was purchased back in 2014 and recently put into use. The rifle was built with select parts consisting of a free float rail hand guard, Nikon scope, 6-9" Harris Tilt bipod and an AR15AccuShim that makes the rifle feel solid as a rock. The rifle is a reliable tack driver. If you are assembling a quality rifle or if a barrel on a rifle is not performing I highly recommend the chromed lined, Hybrid Criterion. 5 Stars. I purchased one of these for my SPR dissipater build and it is awesome. No problem cycling the bolt with the shorter barrel and rifle length gas system, even rapid firing 30 rounds using my 45 degree mounted delta point. I took a few 3-5 shot groups in the sitting position and was doing groups the size of a quarter from 100yds, and I honestly wasn't even trying that hard to shoot a good group. I have a feeling that I'll get some sweet 1/2" groups or less taking some serious shots from the prone position. The ammunition I was using was Remington UMC 55gr so I still had awesome accuracy with factory ammo. Totally recommend this barrel for anyone making a 3 gun rifle or just a lighter weight varmiter. I was concerned about cycling with a shorter barrel using a rifle length gas system but there were no issues whatsoever. The barrel feed ramps aligned perfectly with the upper receiver ramps. The chamber, bore and crown looked spot on. And best of all the barrel consistently shoots very tight groups. I shopped all around for a not too heavy barrel that would perform well with a scope/bipod/free-float setup and the Hybrid Criterion was definitely the right choice. I have been shooting this barrel for over 2 years now and it continues to impress! I have the 16" variant also and it is of equal quality, they both shoot sub-MOA with ball ammo with all the benefits of chrome lining. Would definitely recommend these to anyone looking for top notch quality at a VERY reasonable price!!! Since Criterion is a division of Kreiger barrels, I expected this barrel to be accurate even though the bore is chrome lined. It actually is a super match barrel and the chrome lining does not take away any of it's accuracy. I have a PacNor 223 Super Match Barrel that is very accurate, but really this barrel is more accurate and not finicky with different loads/bullet weights. Several different groups/loads were 3-4 shots into one enlarged hole @ 100 yards. And if that wasn't enough, the powder fouling and copper fouling (small amount) cleaned up in about 5 minutes. Everything fit very well and this barrel shot great with hunting ammo. Shot better than expected for a light contour. Purchased this barrel for my first build and plan to purchase another for another build except in carbine length. I have no doubt it will perform as did the mid-length product. used this barrel on a recent AR build and the results are great. Shooting 77 gr Sierra Match King bullets and shooting under 3/8" groups at 100 yards. I'm sure this will close up even more when the barrel is fully broken in. You want a barrel that performs this is the one you want....no questions! I bought the 16" Mid Length for an SPRish build. I'm using an SLR clamp on gas block and a Daniel Defense Hard Chrome Semi Auto BCG. The barrel is fantastic in every way. Easy to install, not overly heavy, it passed a head space check, and was ready to fire. The first serious group I shot with this barrel was .7" center to center with Hornady TAP 75gr. I'm using a Nightforce 2.5-10x32 scope, and have a great time dinging steel plates out to 400 yards with ease. The barrel cleans out with two patches after shooting. My friends cannot believe that this is a chrome lined barrel. The only companies I will buy barrels from are Criterion and White Oak now. very accurate for a cromelined bore flawless easy to clean and extremely durable iv run thousands of wolf 223 with no drop of in accuracy or any problems what so ever if you are building a battle rifle this is the barrel you are looking for. After reading the reviews I had to try one. Getting .7 moa groups with factory match ammo. Ball ammo is 1-2 moa. With all the longevity benefits of chrome lining I am a happy customer. Thank you Criterion. I wish you would make chrome lined magnum rifle barrels so I could have a barrel that would last a long time in a magnum caliber. Great out of gate. During break in day it was holding 1 inch groups at 50 yrds with standard ball 62gr ammo and a Trijicon MRO. Threw some cheap TULA 75gr in the mix and unbelievable to my eyes the groups closed up, this barrel loves the heavy grain ammo boy howdy... now I will have to stock up on some 75-77gr match to get the full potential out of her. If your looking for the same barrel the USMC Combat shooting team uses this is it and well worth the money. I needed something for a new trigger that I bought. It is for both the ECO<<< pre-ordered /and the BFS trigger system. This gas system does the trick for me. I needed something that could increase the cycle rate so the trigger could not follow the bolt home. Did a little homework and I came up with this. U need a low mass buffer. Helps to take out the weight. So you dont spend $60 dollars on one. Variable gas system Syrac ORD is the way to go. keep the recoil spring standard. My rifle has the felt recoil of a 22 mag to keep u on target, and the cycle rate works like a charm. Like every barrel I bought from these guys sub MOA accuracy is expected with them. .75 moa with bulk 62gr green tips. BLUF: This barrel would make a *fantastic* upgrade to a carbine-length rifle. My RRA M4gery wasn't impressing me with its accuracy, so I sold the 16" HBAR it came with and replaced it with this. Instant gratification. It was shooting 5- and 10-round groups as good as some of my bolt guns. Ammo didn't seem to matter, although Hornady 55-gr VMAX, Nosler Varmageddon and Federal Gold Medal 69gr SMKs produced the best results (no surprises there, really). I would feel comfortable slapping an optic on it and using it as a mid-range varminter...it's that accurate. The fit and finish of this barrel are fantastic! The first trip to the range and this barrel is shooting sub moa with bulk green tip ammo. All I can say is wow! This is the sort of quality I have come to expect from Criterion. Installed in under 15 minutes on an "spr" build of mine. Took it out to the range and shot 1/2 inch groups at 100 yards using winchester white box 62gr fmj. For this to be a heavy barrel it does not weigh the rifle down that much at all. Highly recommend this to anyone looking to build a tac driver! Special note: I'm using 50 grain Barnes Varmint Grenades, with 24.6 grains of IMR 4064, CCI primers, and 2.22" O.A.L. I used this barrel in my 3 gun build. I originally wanted the hybrid contour, but they were out of stock at the time. That being said, I couldn't be happier with this barrel. Paired with a Surefire muzzle break and Syrac adjustable gas block, the recoil is negligible. I don't do bullseye shooting so I can't attest to what sort of groupings this barrel produces, but I have had no trouble engaging any targets at any range I have been presented with in any match I have shot yet. I have used 55 grain 223 and 556 without any problems. Ref Fabricant: 15180HB12 Chrome-alignés, barils de bouton rayé disposent de 223 chambres Wylde et torsion 1-8" pour une meilleure précision potentielle avec 223 et 5,56 munitions de l'OTAN. Procédé unique de chrome-doublure maintient uniformité tout au long de l'alésage et main-rodage permet de garantir les rainures et les terres lisses et uniforme. Ports du gaz sont optimisées pour la longueur du canon et chambering afin d'assurer un vélo fiable et sont disponibles pour carabine, mi-longueur et des systèmes de gaz pour carabine. Aussi caractéristiques 1/2"-28 tpi museler les threads pour comps standards et flash hiders, plus M4 rampes d'alimentation sur le prolongement du canon à l'aide d'alimentation sans heurt et fiable. Barils maintenant sont dotés d'une fossette face au port de gaz, afin de ne jamais changent de blocs vis-sur le gaz au moment du tir. Barils contours hybrides ont un contour effilé et réduit sous le garde-main pour gagner du poids. Fonction contour barils HBAR. 870" diamètre sous le garde-main pour la rigidité et absorption de la chaleur supplémentaire. Ref Fabricant: 15160HY6 Chrome-alignés, barils de bouton rayé disposent de 223 chambres Wylde et torsion 1-8" pour une meilleure précision potentielle avec 223 et 5,56 munitions de l'OTAN. Procédé unique de chrome-doublure maintient uniformité tout au long de l'alésage et main-rodage permet de garantir les rainures et les terres lisses et uniforme. Ports du gaz sont optimisées pour la longueur du canon et chambering afin d'assurer un vélo fiable et sont disponibles pour carabine, mi-longueur et des systèmes de gaz pour carabine. Aussi caractéristiques 1/2"-28 tpi museler les threads pour comps standards et flash hiders, plus M4 rampes d'alimentation sur le prolongement du canon à l'aide d'alimentation sans heurt et fiable. Barils maintenant sont dotés d'une fossette face au port de gaz, afin de ne jamais changent de blocs vis-sur le gaz au moment du tir. Barils contours hybrides ont un contour effilé et réduit sous le garde-main pour gagner du poids. Fonction contour barils HBAR. 870" diamètre sous le garde-main pour la rigidité et absorption de la chaleur supplémentaire. Ref Fabricant: 15160HY8 Chrome-alignés, barils de bouton rayé disposent de 223 chambres Wylde et torsion 1-8" pour une meilleure précision potentielle avec 223 et 5,56 munitions de l'OTAN. Procédé unique de chrome-doublure maintient uniformité tout au long de l'alésage et main-rodage permet de garantir les rainures et les terres lisses et uniforme. Ports du gaz sont optimisées pour la longueur du canon et chambering afin d'assurer un vélo fiable et sont disponibles pour carabine, mi-longueur et des systèmes de gaz pour carabine. Aussi caractéristiques 1/2"-28 tpi museler les threads pour comps standards et flash hiders, plus M4 rampes d'alimentation sur le prolongement du canon à l'aide d'alimentation sans heurt et fiable. Barils maintenant sont dotés d'une fossette face au port de gaz, afin de ne jamais changent de blocs vis-sur le gaz au moment du tir. Barils contours hybrides ont un contour effilé et réduit sous le garde-main pour gagner du poids. Fonction contour barils HBAR. 870" diamètre sous le garde-main pour la rigidité et absorption de la chaleur supplémentaire. Ref Fabricant: 15180HY12 Chrome-alignés, barils de bouton rayé disposent de 223 chambres Wylde et torsion 1-8" pour une meilleure précision potentielle avec 223 et 5,56 munitions de l'OTAN. Procédé unique de chrome-doublure maintient uniformité tout au long de l'alésage et main-rodage permet de garantir les rainures et les terres lisses et uniforme. Ports du gaz sont optimisées pour la longueur du canon et chambering afin d'assurer un vélo fiable et sont disponibles pour carabine, mi-longueur et des systèmes de gaz pour carabine. Aussi caractéristiques 1/2"-28 tpi museler les threads pour comps standards et flash hiders, plus M4 rampes d'alimentation sur le prolongement du canon à l'aide d'alimentation sans heurt et fiable. Barils maintenant sont dotés d'une fossette face au port de gaz, afin de ne jamais changent de blocs vis-sur le gaz au moment du tir. Barils contours hybrides ont un contour effilé et réduit sous le garde-main pour gagner du poids. Fonction contour barils HBAR. 870" diamètre sous le garde-main pour la rigidité et absorption de la chaleur supplémentaire. Ref Fabricant: 15200HY12 Chrome-alignés, barils de bouton rayé disposent de 223 chambres Wylde et torsion 1-8" pour une meilleure précision potentielle avec 223 et 5,56 munitions de l'OTAN. Procédé unique de chrome-doublure maintient uniformité tout au long de l'alésage et main-rodage permet de garantir les rainures et les terres lisses et uniforme. Ports du gaz sont optimisées pour la longueur du canon et chambering afin d'assurer un vélo fiable et sont disponibles pour carabine, mi-longueur et des systèmes de gaz pour carabine. Aussi caractéristiques 1/2"-28 tpi museler les threads pour comps standards et flash hiders, plus M4 rampes d'alimentation sur le prolongement du canon à l'aide d'alimentation sans heurt et fiable. Barils maintenant sont dotés d'une fossette face au port de gaz, afin de ne jamais changent de blocs vis-sur le gaz au moment du tir. Barils contours hybrides ont un contour effilé et réduit sous le garde-main pour gagner du poids. Fonction contour barils HBAR. 870" diamètre sous le garde-main pour la rigidité et absorption de la chaleur supplémentaire. Ref Fabricant: 15200HB12 Chrome-alignés, barils de bouton rayé disposent de 223 chambres Wylde et torsion 1-8" pour une meilleure précision potentielle avec 223 et 5,56 munitions de l'OTAN. Procédé unique de chrome-doublure maintient uniformité tout au long de l'alésage et main-rodage permet de garantir les rainures et les terres lisses et uniforme. Ports du gaz sont optimisées pour la longueur du canon et chambering afin d'assurer un vélo fiable et sont disponibles pour carabine, mi-longueur et des systèmes de gaz pour carabine. Aussi caractéristiques 1/2"-28 tpi museler les threads pour comps standards et flash hiders, plus M4 rampes d'alimentation sur le prolongement du canon à l'aide d'alimentation sans heurt et fiable. Barils maintenant sont dotés d'une fossette face au port de gaz, afin de ne jamais changent de blocs vis-sur le gaz au moment du tir. Barils contours hybrides ont un contour effilé et réduit sous le garde-main pour gagner du poids. Fonction contour barils HBAR. 870" diamètre sous le garde-main pour la rigidité et absorption de la chaleur supplémentaire. Ref Fabricant: 15160UL8 Chrome-alignés, barils de bouton rayé disposent de 223 chambres Wylde et torsion 1-8" pour une meilleure précision potentielle avec 223 et 5,56 munitions de l'OTAN. Procédé unique de chrome-doublure maintient uniformité tout au long de l'alésage et main-rodage permet de garantir les rainures et les terres lisses et uniforme. Ports du gaz sont optimisées pour la longueur du canon et chambering afin d'assurer un vélo fiable et sont disponibles pour carabine, mi-longueur et des systèmes de gaz pour carabine. Aussi caractéristiques 1/2"-28 tpi museler les threads pour comps standards et flash hiders, plus M4 rampes d'alimentation sur le prolongement du canon à l'aide d'alimentation sans heurt et fiable. Barils maintenant sont dotés d'une fossette face au port de gaz, afin de ne jamais changent de blocs vis-sur le gaz au moment du tir. Barils contours hybrides ont un contour effilé et réduit sous le garde-main pour gagner du poids. Fonction contour barils HBAR. 870" diamètre sous le garde-main pour la rigidité et absorption de la chaleur supplémentaire. Ref Fabricant: 15140HY8 Chrome-alignés, barils de bouton rayé disposent de 223 chambres Wylde et torsion 1-8" pour une meilleure précision potentielle avec 223 et 5,56 munitions de l'OTAN. Procédé unique de chrome-doublure maintient uniformité tout au long de l'alésage et main-rodage permet de garantir les rainures et les terres lisses et uniforme. Ports du gaz sont optimisées pour la longueur du canon et chambering afin d'assurer un vélo fiable et sont disponibles pour carabine, mi-longueur et des systèmes de gaz pour carabine. Aussi caractéristiques 1/2"-28 tpi museler les threads pour comps standards et flash hiders, plus M4 rampes d'alimentation sur le prolongement du canon à l'aide d'alimentation sans heurt et fiable. Barils maintenant sont dotés d'une fossette face au port de gaz, afin de ne jamais changent de blocs vis-sur le gaz au moment du tir. Barils contours hybrides ont un contour effilé et réduit sous le garde-main pour gagner du poids. Fonction contour barils HBAR. 870" diamètre sous le garde-main pour la rigidité et absorption de la chaleur supplémentaire. Ref Fabricant: 15100HY6 Chrome-alignés, barils de bouton rayé disposent de 223 chambres Wylde et torsion 1-8" pour une meilleure précision potentielle avec 223 et 5,56 munitions de l'OTAN. Procédé unique de chrome-doublure maintient uniformité tout au long de l'alésage et main-rodage permet de garantir les rainures et les terres lisses et uniforme. Ports du gaz sont optimisées pour la longueur du canon et chambering afin d'assurer un vélo fiable et sont disponibles pour carabine, mi-longueur et des systèmes de gaz pour carabine. Aussi caractéristiques 1/2"-28 tpi museler les threads pour comps standards et flash hiders, plus M4 rampes d'alimentation sur le prolongement du canon à l'aide d'alimentation sans heurt et fiable. Barils maintenant sont dotés d'une fossette face au port de gaz, afin de ne jamais changent de blocs vis-sur le gaz au moment du tir. Barils contours hybrides ont un contour effilé et réduit sous le garde-main pour gagner du poids. Fonction contour barils HBAR. 870" diamètre sous le garde-main pour la rigidité et absorption de la chaleur supplémentaire.